Describe what is meant by the “replicability crisis” in psychology. Describe some questionable research practices. Identify some ways in which scientific rigour may be increased. Understand the importance of openness in psychological science. At the start of this book we discussed the “Many Labs Replication Project,” which failed to replicate the original finding by Simone Schnall and her colleagues that washing one’s hands leads people to view moral transgressions as less wrong (Schnall, Benton, & Harvey, 2008). Although this project is a good illustration of the collaborative and self-correcting nature of science, it also represents one specific response to psychology’s recent “replicability crisis,” a phrase that refers to the inability of researchers to replicate earlier research findings. Consider for example the results of the Reproducibility Project, which involved over 270 psychologists around the world coordinating their efforts to test the reliability of 100 previously published psychological experiments (Aarts et al., 2015). Although 97 of the original 100 studies had found statistically significant effects, only 36 of the replications did! Moreover, even the effect sizes of the replications were, on average, half of those found in the original studies (see Figure 13.5). Of course, a failure to replicate a result by itself does not necessarily discredit the original study as differences in the statistical power, populations sampled, and procedures used, or even the effects of moderating variables could explain the different results (Yong, 2015). Figure 13.5 Summary of the Results of the Reproducibility Project Reprinted by permission from Macmillan Publishers Ltd: Nature [Baker, M. (30 April, 2015). 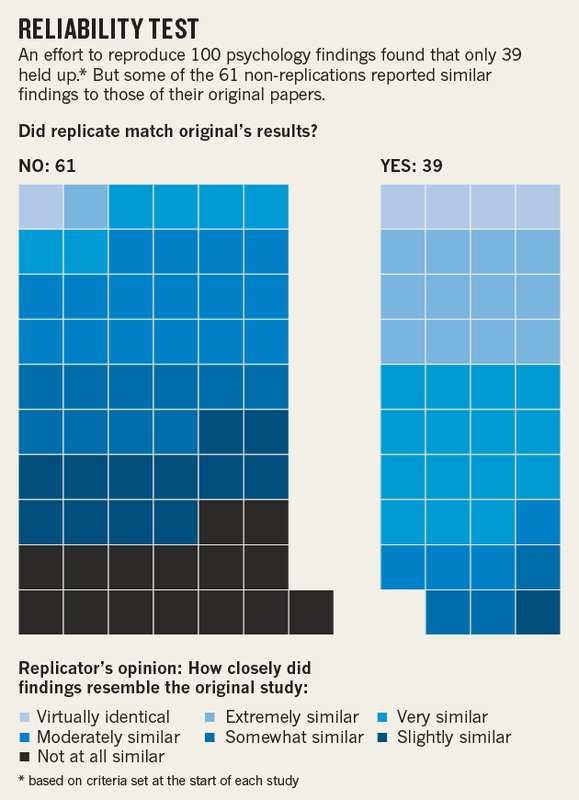 First results from psychology’s largest reproducibility test. Nature News. Retrieved from http://www.nature.com/news/first-results-from-psychology-s-largest-reproducibility-test-1.17433], copyright 2015. The selective deletion of outliers in order to influence (usually by artificially inflating) statistical relationships among the measured variables. The selective reporting of results, cherry-picking only those findings that support one’s hypotheses. Mining the data without an a priori hypothesis, only to claim that a statistically significant result had been originally predicted, a practice referred to as “HARKing” or hypothesizing after the results are known (Kerr, 1998). A practice colloquially known as “p-hacking” (briefly discussed in the previous section), in which a researcher might perform inferential statistical calculations to see if a result was significant before deciding whether to recruit additional participants and collect more data (Head, Holman, Lanfear, Kahn, & Jennions, 2015). As you have learned, the probability of finding a statistically significant result is influenced by the number of participants in the study. Designing and conducting studies that have sufficient statistical power, in order to increase the reliability of findings. Publishing both null and significant findings (thereby counteracting the publication bias and reducing the file drawer problem). Describing one’s research designs in sufficient detail to enable other researchers to replicate your study using an identical or at least very similar procedure. Conducting high-quality replications and publishing these results (Brandt et al., 2014). One particularly promising response to the replicability crisis has been the emergence of open science practices that increase the transparency and openness of the scientific enterprise. 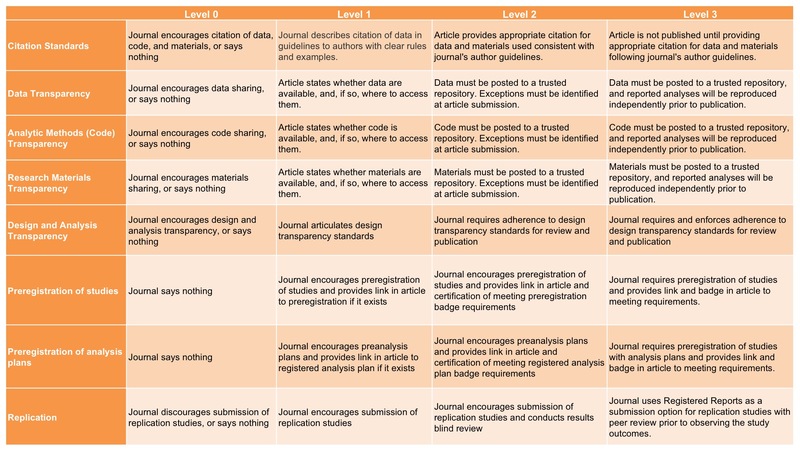 For example, Psychological Science (the flagship journal of the Association for Psychological Science) and other journals now issue digital badges to researchers who pre-registered their hypotheses and data analysis plans, openly shared their research materials with other researchers (e.g., to enable attempts at replication), or made available their raw data with other researchers (see Figure 13.6). These initiatives, which have been spearheaded by the Center for Open Science, have led to the development of “Transparency and Openness Promotion guidelines” (see Table 13.7) that have since been formally adopted by more than 500 journals and 50 organizations, a list that grows each week. When you add to this the requirements recently imposed by federal funding agencies in Canada (the Tri-Council) and the United States (National Science Foundation) concerning the publication of publicly-funded research in open access journals, it certainly appears that the future of science and psychology will be one that embraces greater “openness” (Nosek et al., 2015). In recent years psychology has grappled with a failure to replicate research findings. Some have interpreted this as a normal aspect of science but others have suggested that this is highlights problems stemming from questionable research practices. One response to this “replicability crisis” has been the emergence of open science practices, which increase the transparency and openness of the research process. These open practices include digital badges to encourage pre-registration of hypotheses and the sharing of raw data and research materials. Discussion: What do you think are some of the key benefits of the adoption of open science practices such as pre-registration and the sharing of raw data and research materials? Can you identify any drawbacks of these practices? From the “Replicability Crisis” to Open Science Practices by Paul C. Price, Rajiv Jhangiani, & I-Chant A. Chiang is licensed under a Creative Commons Attribution-NonCommercial-ShareAlike 4.0 International License, except where otherwise noted.